I do not like writing on the politics but when it hampers the reform of the nation there are concerns should be raised !! Few facts Indian railways has 1.4 employees second largest employer in the world, every day it carries the entire population of Australia. 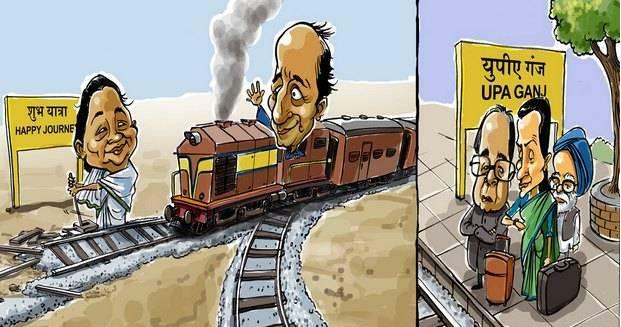 The only railways in the world to present separate budget of its own before Parliament. The railway minister deserves kudos for being bold enough to touch this holy cow of the rail budget.He just thought straight on the railways. All excellent steps in the right direction. No point in penny-pinching on the fares and destroying the railways. Current fares are outrageously low and will only result in the death of the railways as we see it happening slowly. (Dirty unusable toilets, trash everywhere on the stations and tracks, overcrowded trains, stations and facilities, travel dates that are two months out in the future etc), all these issues were addresed on the serious note. How can the railways fares be same from last 10 years. When auto fares goes up almost every year ? Is this another Air India in making. Feel sorry for travelers, as they would see neat and clean trains only in movies and records for fastest trains being created in China/France……. Though hare hike is must but after so many yrs. for not increasing fare you dont think some should be responsoble & should be punished as they might enjoyed political benefits isn’t it?